A month or so ago, my friend Adam (K6ARK) asked me if I was interested in joining an expedition to the Holcomb Valley area near Big Bear to have a little Summits On The Air (SOTA) fun. I was definitely in. 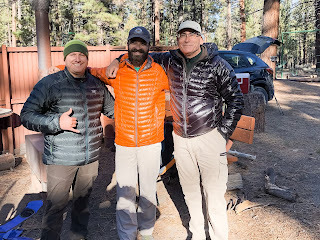 Adam did some planning and sent over some charted peaks that we could do and announced the expedition on a So Cal SOTA mailing list. It’s a pretty big list but people are busy and have varying interests so the only takers for the trip were Adam, myself, and W6RIP, Kevin, who lives not too far away from the planned area of operation. Adam has a friend that owns a piece of land that was next to the campground and let us setup there for base camp. It was a perfect central area, complete with some small cabins, outdoor cooking and R&R area with wood burning stove. The plan was to drive up Friday and hike and play with radios on Friday night, Saturday and Sunday. I was pretty stoked. Unfortunately the trip was cut short by a day as Adam had an unexpected work trip. That worked out for me since I really needed to spend some time with my daughter and do some stuff and I’ll be traveling next weekend. Leading up to the expedition I spent some time charting all the peaks in the area that I was given from Adam. In addition, I tried to lay out a path to each of the peaks in case I was going to be on my own. 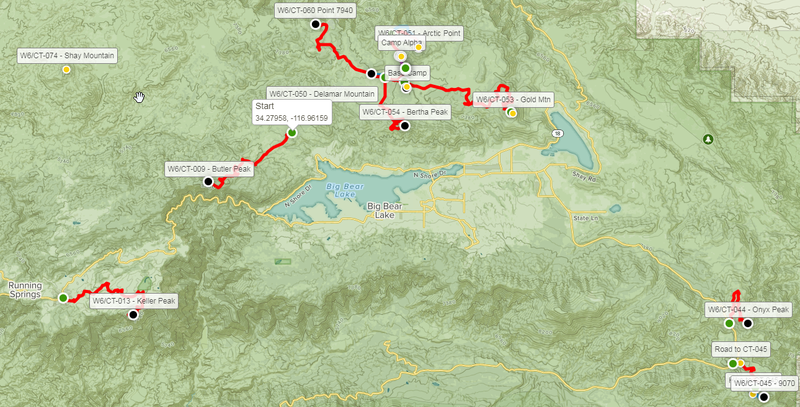 I'm unfamiliar with the area, so I spent some time charting a ingress point and the best course up to each peak. I know I wouldn’t be able to do all of these but we weren’t sure which ones we would prioritize. With an return on Saturday we would only be able to hit a few. The idea was that if several other operators showed up, we’d split up a bit and do different peaks and conduct some summit-to-summit comms as well. That’s always kinda fun. Unfortunately, a lot of guys that wanted to come had other things going on this weekend. The trip was a great success in my eyes, as I was able to make contacts in New Zealand, Russia, Puerto Rico, Finland, Japan, Canada, and the mainland US and all but one of those was Friday night!!! This is the most number of countries I’ve ever had during a trip and it was all thanks to Adams suggestion that we activate a mountain at night during a world-wide ham contest. Russia is also a first for me and I had two contacts there. There was a major world-wide contest going on. That meant that all of the major stations with really big “ears” were working and we’d have a better chance at doing some DX. The airways were packed Friday night and Saturday. Let’s break the trip down summit by summit. 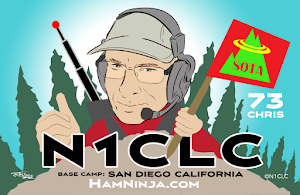 I’ve been itching to get out and do some hiking and Summits On The Air with my ham radio. I texted my friend Adam, K6ARK to see if he had any plans for today, or if not, if he could suggest some peaks. 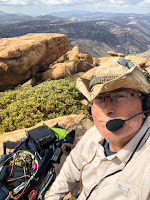 Thanks to Adam, today’s SOTA mission was to to W6/SC-092 - Morena Butte, test my new boots, and get in shape for the San Diego and surrounding area hiking season (it’s too hot to hike in the summer here). The secondary objective was to continue to test the AnyTone DMR radio in the field and see how it performs. The weather, with medium height clouds,was perfect for some hiking and the clouds always add a nice texture to things. I launched from the house at about 0700 local and headed out the I-8 East to Lake Morena and the trailhead for the Pacific Crest Trail, just off the Lake Morena Campground. The drive to the IAF is a little over an hour from the house and pretty easy to get to. The area of operation is heavily trafficked except for the fork that heads off up to the butte, about a mile. The only people I saw the whole time were a family coming up the hill about a mile from the car on my way back, so it was quiet.